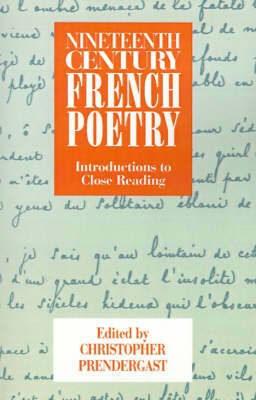 This volume of essays, written by scholars from a wide range of critical and theoretical viewpoints, presents a fresh approach to the study of nineteenth-century French poetry. Each of the eleven essays, on different poets from Lamartine to Mallarme and Laforgue, focuses on the detailed organisation of a single poem. The method of close reading has been adopted in order to effect an introduction to the analysis of the 'basics' of poetic language (sound, metre, syntax, etc. ), and in order to explore and illustrate some of the claims and arguments about poetry arising from developments in the prevailing literary theory. Theoretical positions are posed and tested in the terms of practical analysis and interpretation. Christopher Prendergast's introduction to the volume situates the essays in a series of general perspectives and contexts, and Clive Scott has provided an appendix on French versification.